A big, yellow cause garnered 1,976 backers from “Kickstarter” campaign “I Am Big Bird” and raised enough funds to bring the documentary about the man that played the eight-foot, two-inch part costume, part puppet bird in the classic long-time running children’s television program “Sesame Street” to completion and currently being shown in film festivals. Sometime in 2009, three men got together and made the decision to tribute Caroll Spinney, the longest-standing original Sesame Street muppeteer of all time through their Copper Pot Pictures production company. It didn’t matter how long or how many hours they had to work, they were intent on seeing this film come to fruition for all the love Spinney’s Big Bird has brought to them and millions of other children all over the world throughout the years. Yes, if you didn’t know it by now, Caroll Spinney has indeed played Big Bird on Sesame Street for 42 years. What you may not know is that Spinney also plays Oscar the Grouch. That’s talent. This man deserves his story to be told and Copper Pot Pictures brought it to life for you. It’s amazing that this film is not in major theatres all over the country. Yet, it only goes to prove the independent spirit within the filmmakers to make it happen on their own. Director Dave LaMattina, as Writer/Director, Chad Walker, as Director/Director of Photography and Editor as well as Clay Frost, Executive Producer, in essence were the three musketeers, to pay homage to this extraordinary muppeteer! 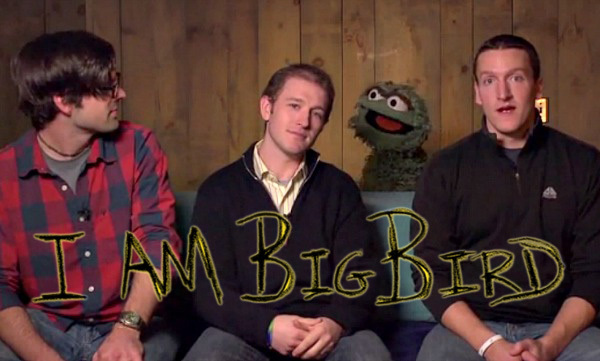 “I Am Big Bird” is their second feature-length film and is a sure indication of the merit they bring to the world of cinema. It was LaMattina who thought of the idea in the first place, having landed a coveted internship at Sesame Street years ago, after graduating from famed film school University of Southern California. When they pitched Spinney and his wife Debra the idea, they jumped at it. 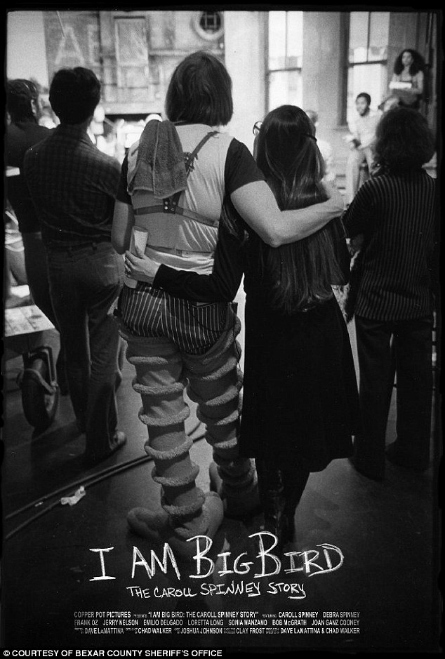 As Frost says: “Deb and Caroll were the story,” noting it was their love story that spanned nearly 40 years that made Spinney the loving man in the bird suit all these years. The film intertwines on-camera interviews with Spinney’s voice over narration, tons of archival home video footage and photos (mostly taken by Spinney’s wife Debra long before home movies were common), as well as behind-the-scenes footage on set and off with the late great Jim Henson himself. In addition, there is a creative aspect to the film with real-life animation. The animated parts are particularly done to explain certain points, such as how the mechanics of working Big Bird actually works with Spinney inside the big yellow suit! Sesame Street itself, was also extremely accommodating to any and all needs the filmmakers had to see this movie come to life. Yet, one of the greatest desires all three had was to be on the actual set of Sesame Street! While they filmed the on set footage, they had a chance to see the muppeteers live and at work! Indeed, it was a childhood dream come true. 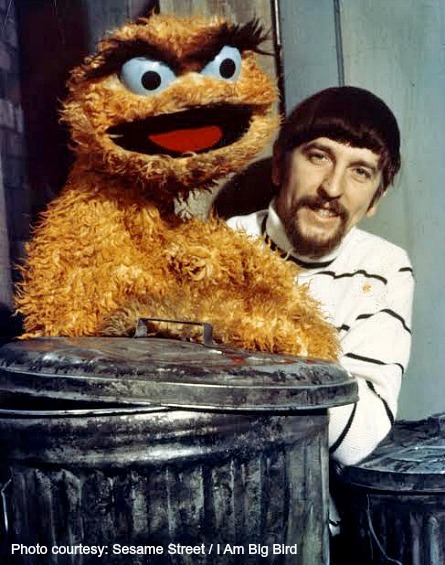 Pictured: Caroll Spinney with Oscar The Grouch. Yet, in order to see it completely fulfilled, they knew they had to raise funds. They started a fundraising effort through a online fund-raising company called “Kickstarter” that helps artists raise funds. People were able to back their project by contributing as little as $1 all the way up to $10,000 or more. They raised $124,114 out of their goal of $100,000. In exchange, contributors received personal access to their personal production blog, digital downloads of the film and soundtrack, T-Shirts, Blu-Rays of the movie, and original sketches by Caroll Spinney himself all depending on the amount contributed. The end result, their project got 124% funded! While the filmmakers juggled other work obligations and family lives with the making of this documentary, they never gave up on their persistence to see it come to life. They also consciously took their time to ensure the film was done with the utmost professional of quality and waited for the funding for each and every turn to be there to ensure it was so. LaMatinna also comments on the creative benefits to taking one’s time to ensure story quality. “The story was a much richer and complete story,” LaMatinna says for having taken a longer time to develop and really get to know their subjects. Hence, like most good things in life, quality cannot be rushed. It’s certainly true for getting to know people and yes, many times for art. This film proved that with combining the real life story of one of America’s heroes in a truly beautiful form of artistry in I am Big Bird.